Peru’s attraction points and things to do in Peru are listed. Smart tips and recommendations about the accommodation and dining options are listed. The heritage of Inca Empire, the stunning view of Andes Mountains, impressing architecture, enviable social life, breathtaking nature and the centuries old history is calling you. Peru, the country of hidden treasures is here for you to unveil. Undoubtedly the most fascinating destination in South America, Peru welcomes you with its rich heritage of Inca Empire. Dating back to 9000 years BCE Peru boasts its deep culture and history that astonishes the visitors. You can visit Machu Picchu that is on the list of UNESCO World Heritage and get amazed by the remains of the remarkable Inca Empire. Not only Machu Picchu, but also Cusco, that is situated at about 3500 meters above sea level, awaits you with its striking heritage. As well as the history, Peru amazes with its cuisine, too. Eating in Peru is just a new discovery at every turn. You might try new tastes like ceviche or causa and immediately get addicted to them. Inca Kola or Pisco Sour? Make your choice and enjoy. The nature and wildlife live with you in this fantastic country. You can watch penguins parade and sea lions diving into the water. Taking a walk in rainforests is another alternative to inhale the pure nature. Are you interested in buying unique goods from the countries you visit? You cannot limit the things you would like to buy in Peru. Sounds threatening? Do not worry. You do not need to spend a fortune while shopping in this country since it is not a tourist hunter and you can buy the world at a very reasonable price. Peru awaits you with warm-hearted and tourist friendly people, fantastic setting and breathtaking history. Do not miss the chance to discover this hidden treasure. 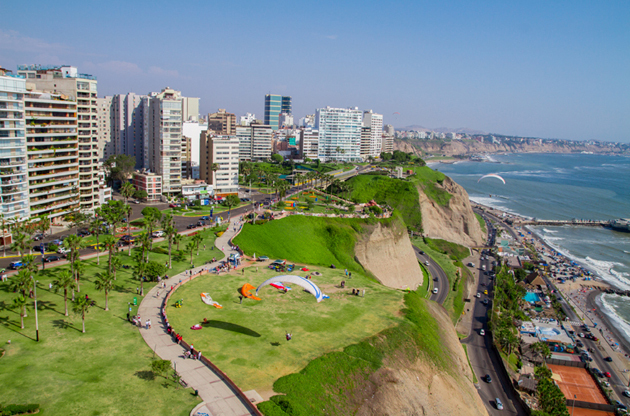 Peru, whose capital city is Lima, is located in central Pacific coast in South America. Among the neighbors of it, there are Bolivia, Ecuador, Brazil and Chile. Having worldwide reputation, Nazca Lines is located in the Nazca Desert in the south of the country. These lines are kilometers long in some points and believed to date back to 200 BC. To be able to recognize these shapes you need to look from the air. Being under the coverage of UNESCO World Heritage, Nazca Lines is believed to be drawn by the aliens according to the theory of Erich Von Daniken that was put forward in his cult book Chariots of the Gods. Being one of the New Seven Wonders of the World, Machu Picchu is under the protection of UNESCO World Heritage. This ancient city of Inca Empire is located on Andes Mountain and remains still as a mystery. To unveil this mystery, do not miss the chance to discover the magical Machu Picchu. Located on the south coast of the country, Ballestas Islands are accessible from Paracas and offers you unforgettable expedition with penguins, sea otters and many more. For a perfect ecotourism experience, visiting Ballestas Islands will be a great choice. Lake Titicaca is the largest lake in terms of the volume of water and the highest navigable one in South America. Located on the border of Bolivia and Peru, Lake Titicaca is worth your visit. Peruvian Cuisine offers a great diversity from the coast to highlands. The main ingredients are corn, potato and beans and raw seafood are highly consumed especially in coastal areas. In highlands, generally game meat is preferred to seafood. Since spicy dishes are dominant in this cuisine, you had better ask how spicy the food you are about to eat is. Fish is marinated in lemon juice and served with chopped onions. Chopped steak served with potatoes. A meat stuffed and fried pastry. A type of soup that is made of vegetable juice, potato and starch served with meat dishes. National drink that is a kind of brandy. The most popular soft drink that has a sweet fruity flavor. A type of herbal tea that is made using coca plant and it is known to be good for the altitude sickness. Peru is rich in handcrafts and tapestries depicting the typical life of Peru. If you want to buy something for your beloved ones, these handcrafts would be priceless. Spare some place in your luggage for the following. Peru does not require visa from the travelers except for some Asian, African and communist countries. You can stay up 30-90 days in Peru with an Andean Immigration Card which you need to return upon leaving the country. For the countries Peru requires visa, you can check Lima Easy’s website . Dating back 6000 years, Peru is a land of a deep cultural identity and historic attractions which make the country inspirational and soul-feeding. Being a cost saving country in comparison with other countries in South America, Peru is again advantageous. Having world class venues and hotels with high capacities, this country organizes global large scale events like symposiums, congresses, conferences, tradeshows, fairs and seminars and draws worldwide attention each year.